Jambo Everyone: Caption This Photo Contest; Win A Free Animal Kingdom Mickey Mouse Disney Pin! Caption This Photo Contest; Win A Free Animal Kingdom Mickey Mouse Disney Pin! Today we have a Caption This Photo Contest for you! 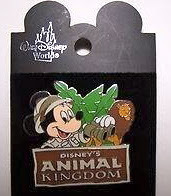 It's your chance to win a Safari Mickey Pin from Disney's Animal Kingdom courtesy of our favorite Disney travel expert Jennifer Greene! Just follow this link to our Facebook page and write us your best caption.